Mike Ashley’s Sports Direct has cancelled a bid for collapsed cafe chain Patisserie Valerie, just two days after making an offer. The retail billionaire announced his bid for the chain on Friday evening. Sports Direct offered £15m, but was told by administrator KPMG it would need to offer up to £2m more than this, according to the Financial Times. Patisserie Valerie collapsed last month. KPMG closed 70 outlets, but kept 121 open in the hope of selling them. Mr Ashley is thought to be facing several competing bids for Patisserie Valerie, including, according to reports, from Costa, the coffee chain bought by Coca-Cola last year. The retail tycoon, who also owns English Premier League football club Newcastle United, made his name building budget chain Sports Direct into Britain’s biggest sporting goods retailer. He has since become known for buying up struggling retail chains and bought both department store chain House of Fraser and cycle shop Evans out of administration last year. Sports Direct’s sprawling High Street empire also includes lingerie chain Agent Provocateur as well as shareholdings in Debenhams, French Connection and Game Digital. Last week, it emerged as front runner to buy Sofa.com. 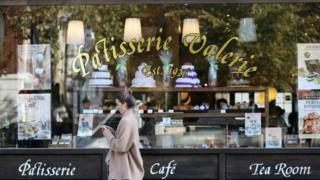 Patisserie Valerie collapsed after an accounting scandal which left the firm without enough money to pay its debts. Rescue talks with banks HSBC and Barclays to restructure the business broke down, leaving no option but administration. The cafe chain employed about 3,000 staff, but some 900 jobs were lost in the initial wave of closures after KPMG was appointed to run the business on 22 January. In 2006, Luke Johnson’s Risk Capital Partners bought a majority stake when it had eight stores. In addition to Patisserie Valerie, the company’s other brands include Druckers Vienna Patisserie, Philpotts, Baker & Spice and Flour Power City. The Serious Fraud Office is carrying out a criminal investigation into Patisserie Valerie and finance director Chris Marsh was arrested and released on bail after having been suspended by the company. Also under investigation, by the Financial Reporting Council, are former Patisserie Valerie auditors Grant Thornton.